Photos of a new phone purportedly from Motorola have leaked online showing a small, square-shaped device called the FlipOut. The phone is believed to be running Android OS 2.1 and using Motorola's MotoBlur visual overlay. 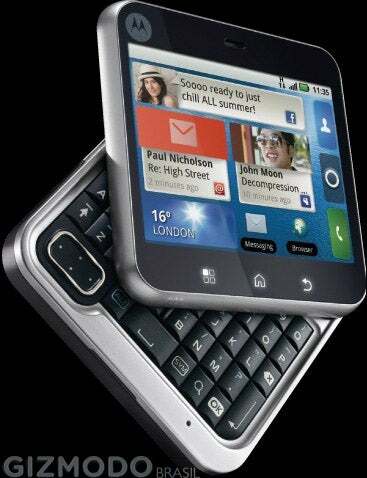 The FlipOut's form factor, similar to Nokia's 7705 Twist , features a screen that can slide up to reveal a QWERTY keyboard or flipped over in front of the keyboard component to show a compact device with the screen facing front. There's no word on pricing or carriers, but rumors suggest this phone could be out by June, according to Gizmodo Brazil . The new device has some interesting specs, if rumors are to be believed, including a 3.1 mega-pixel camera, 2.8-inch screen, QWERTY Keyboard and GPS. There's no word on Wi-Fi or 3G connectivity. The device appears to come in three colors: black, pink and green. The most interesting aspect of this device, if it's the real thing, is the suggestion that the FlipOut is running Android OS 2.1 (Eclair), the latest version of Android, as well as the MotoBlur overlay. So far, Motorola's social networking-focused overlay has been used with Android versions 1.5 (Cupcake) and 1.6 (Donut), but has not yet been shipped on a device running 2.1. Motorola's Cliq and recently released Cliq XT , for example, run Android 1.5 and the Motorola Devour uses Android 1.6. Meanwhile, Motorola's Backflip from AT&T, another MotoBlur device, is currently running Android 1.5, but is supposed to get an upgrade to Android 2.1 later this year. So if the FlipOut appears in June, as rumors suggest, it would be Motorola's first device running MotoBlur and Android 2.1. It's not clear if the latest version of Android would allow Motorola to add any new features to the MotoBlur overlay. Since these rumors come from a Brazil-based blog, it's possible that Motorola's purported FlipOut device may not be coming to U.S. customers at all. The FlipOut could be meant for markets like Brazil and China where entry-level smartphones have more potential to be popular at a lower price point than premium devices like the iPhone and Google's Nexus One. Dell recently followed a similar strategy by first releasing the Dell Mini 3 in Brazil and China. Nevertheless, if the FlipOut does come to the U.S. it could be an interesting competitor against similar devices such as Microsoft's recently released Kin phones .